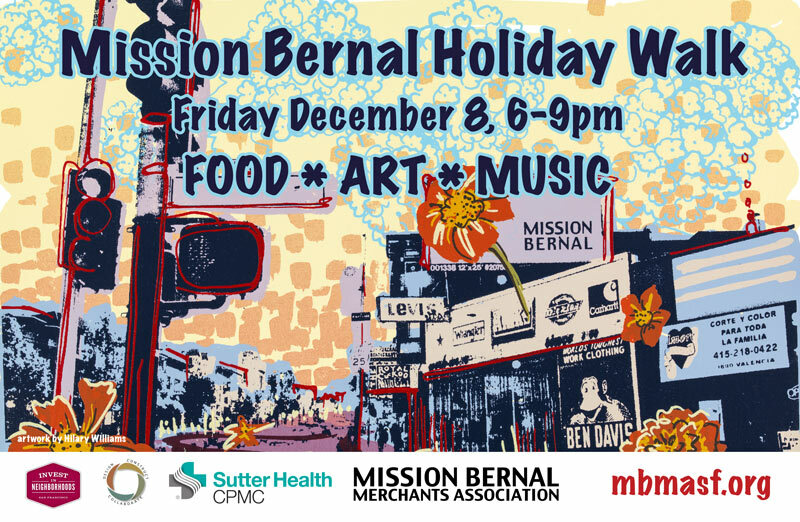 The Mission Bernal Merchants Association is excited to invite San Francisco to explore the vibrant Mission Bernal small business community on Friday December 8th, from 6pm to 9pm. The numerous locally owned restaurants, bars, galleries, coffee shops, and other businesses that line Mission Street from Cesar Chavez Street to Randall Street—along with businesses on adjacent side streets such as 29th Street—will open their doors and put out their welcome mats to the city at large, in a neighborhood celebration aimed at encouraging neighbors and visitors alike to peruse their wares, get to know local business owners, and sample the neighborhood’s diverse flavors. Emerging and legacy businesses alike would like to welcome you to our festive home. As visitors explore the neighborhood, the MBMA encourages them to post photos and videos of the sights, sounds, and tastes they experience on Facebook, Twitter, and Instagram, with the hashtag #MBMAHW. As an extra incentive, throughout the evening, the MBMA will be monitoring the hashtag and giving away thank-you gifts to those tagging their adventures in Mission Bernal! The MBMA invites you to an evening of observance and festivities Friday, August 18, 6-8pm near 3300 Mission Street.